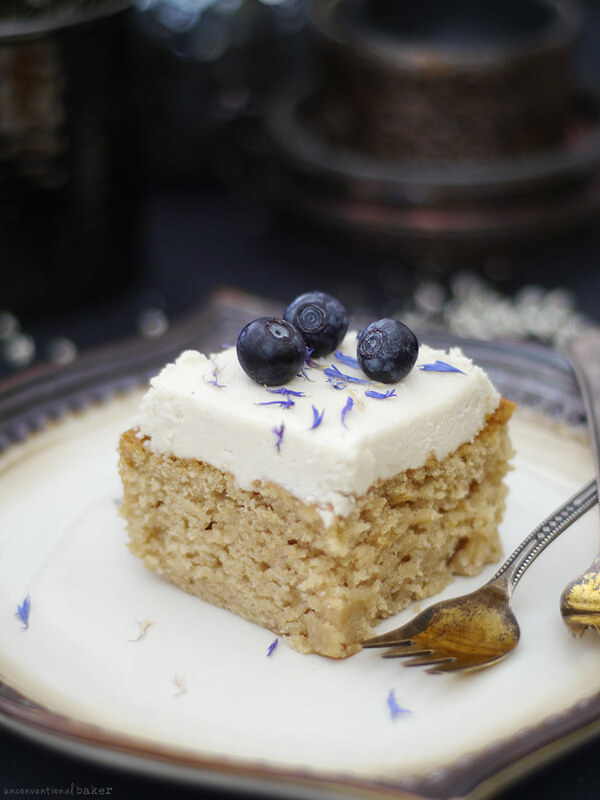 The other day I was asked by a blog reader for some ideas for her son’s first birthday party — she needed a healthier cake themed blue, white, and gold, and something that would satisfy a large crowd of picky eaters. 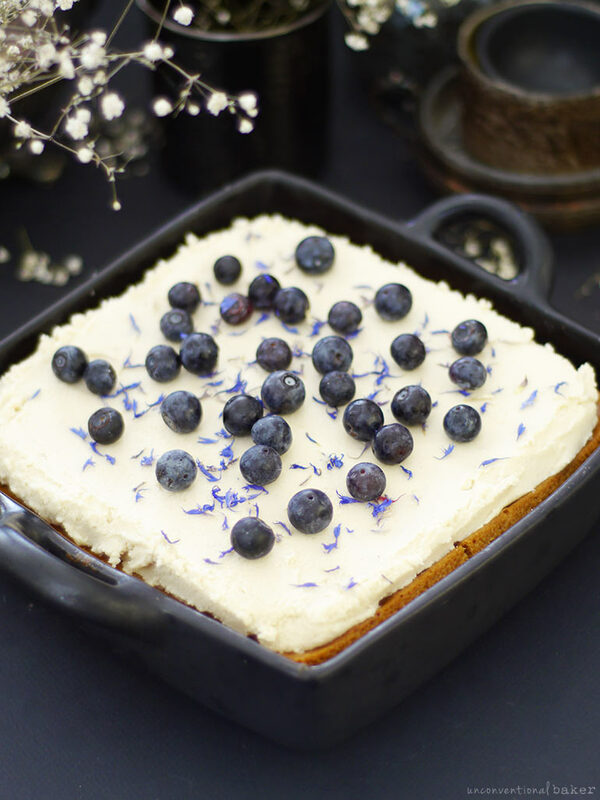 So I set aside the weird veggies, and came up with a very respectable raw blueberry cashew cheesecake, but also thought to try something baked as an option… and so this classic-tasting cashew vanilla birthday cake was born. Now originally I was thinking this white texas sheet cake could be an option. 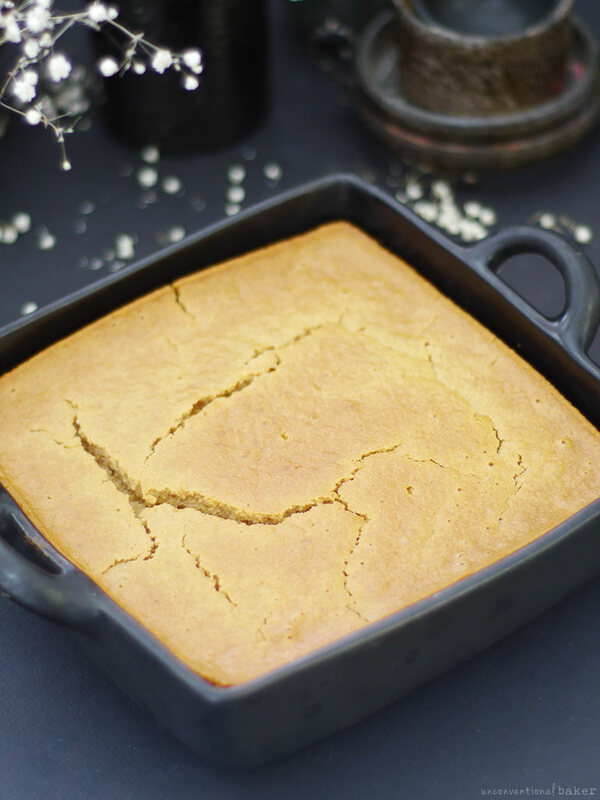 It’s another classic cake that everyone loves — gluten-free / dairy-free, etc. But it was made with EB fake butter, which I’m ok with for an occasional treat, but since the request was for a “healthier” cake, I thought I’d better leave that out. So instead this lovely vanilla cake needs no butter or oils and yet is so moist, and has this paradoxical delicate-yet-sturdy thing going on — thanks to cashew butter! As you can see in the pic above, I reshaped it into a layer cake and it worked a treat. The cake base, once cooled, also makes a great cut-out cake for those looking to make a special shaped dessert. Now this frosting. 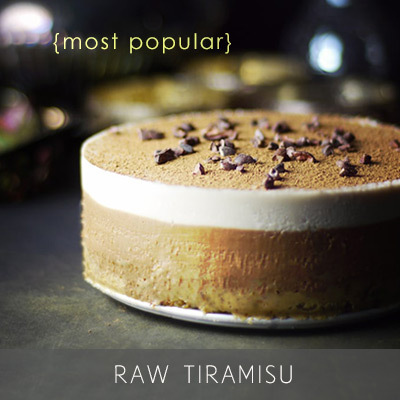 If you like frosting–this one is incredible! It emerged from the ingredients I had on hand, since going to a store that carried anything remotely relevant wasn’t in the cards for the next few weeks. Luckily, it turned out perfectly, and is probably my first truly WHITE dairy / refined sugar-free frosting. I wanted to show you the top of the cake above — the top forms a slight crust and is a bit cracked — that is normal. 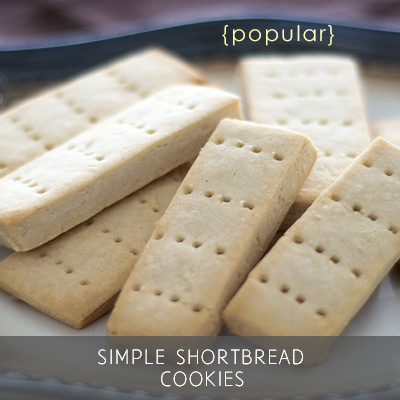 The thin “crust” slices through quite easily and makes frosting a breeze. The cake underneath it though is very delicate and dainty. And once frosted, you’ll see no cracks whatsoever, so worry not. The frosting needs a bit of good timing to make it work. Once blended, it will be soft. Not ideal for frosting with straight away (unless you’re just doing a layered whip-filled cake, in which case it works straight away). To get a smooth set frosting you’ll have to chill it for at least an hour or longer until it’s at a good, more firm, spreadable consistency. You don’t want it to be too firm though as that will make spreading hard — so just thaw it out a little if you leave it in the fridge too long. Once frosted though, you’re in smooth sailing territory and it’ll stay put quite nicely. I actually froze mine ahead of time and then just thawed it out when I was ready to work with it. Just don’t microwave it (or if you do, make sure it’s gently) because coconut butter tends to burn VERY easily. For a nut-free cake, go with the original texas sheet cake idea. For a soy-free frosting, use some pre-soaked raw cashews instead. You’ll definitely need a power blender for the recipe to work (I had to use my tamper for the Vitamix), but with some patience it’ll happen :) You could also use this chocolate frosting instead. 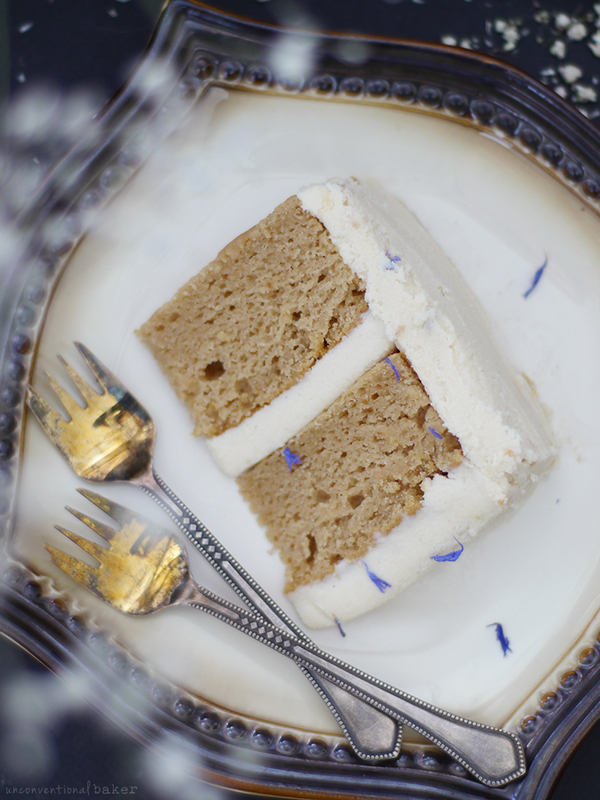 A gluten-free, vegan vanilla birthday cake recipe with a thick layer of dairy-free vanilla frosting. Pre-heat the oven to 350F. 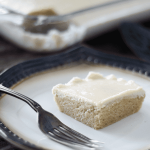 Oil an 8×8 square cake pan. Set aside. Bake in a preheated oven for approximately 40-45 mins (until the top is nicely golden and a skewer inserted in the center of the cake comes out completely dry). Remove from oven and cool on a cooling rack completely before proceeding to frost. While the cake is baking, prepare the frosting by combining all the ingredients except for shredded coconut in a power blender until completely smooth. Add in shredded coconut and mix once more (use the vitamix tamper to help you along, or pause to scrape sides and keep blending until the coconut is incorporated). Transfer into a glass container and refrigerate until cake is ready to be frosted (or for at least 1-2 hours to let it firm up). 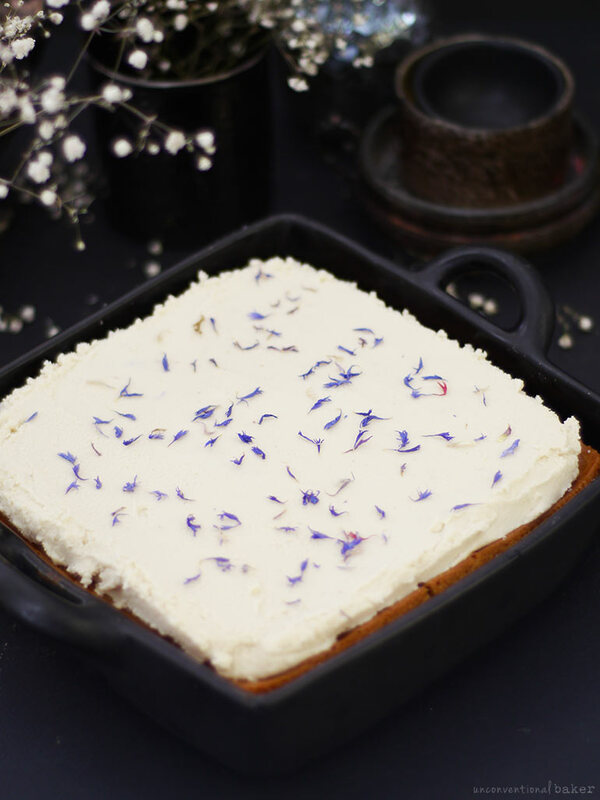 Once ready, frost cake, decorate with blueberries and flower petals and serve! Disclaimer: this post contains affiliate links for coconut butter, orange blossom water, and dried edible blue cornflower petals. Thanks for sharing, Andrea. That can definitely be frustrating. Would love to hear how you go. With substituting GF flour for AP flour in recipes, I find not all mixes work as well. Some can be dry or a bit dense. My favorite as a 1:1 substitution is by far Pamela’s Artisan GF flour. In general, mixes that use sweet sticky rice flour tend to work well. I love vanilla birthday cake so this looks delicious! Can I use Pamela’s baking and pancake mix instead of buying all of the different ingredients you list ? If so, how much would I use? Hi Kathy, I’ve never tried the baking and pancake mix personally (I’ve only used Pamela’s Artisan mix in the past). By different ingredients I assume you mean these the rice flour, tapioca starch, and glutinous rice flour, and guar gum? The reason there’s a chance it would turn out a bit different is that the ratios of ingredients are different in the Pamela’s mix I’ve used to the ratios in this recipe — not by much, but sometimes that’s enough to alter a gluten-free recipe. I think overall though it’s worth trying in a pinch (and I’d love to hear how it turns out if you do). I have a feeling it should work — my experience with Pamela’s Artisan mix has been great so far overall. If you try it, I’d use 1 1/2 cups + 2 tbsp (to replace the rice flour, tapioca, glutinous rice flour, and guar gum). This cake looks beautiful! Does the frosting taste like coconut? I’d say yes, it’s not mega-coconutty (if you’re looking for something for a coconut theme), but you can definitely taste it. Hey! I’m just working on this recipe now, but I made the frosting and it tastes really tofu-y… Any suggestions? Hey Morgan, what a bummer it didn’t turn out.. :o What kind of tofu did you use? And did you change anything in the ingredients? You definitely shouldn’t be able to taste the tofu… Only thing I can recommend to save the frosting at this stage is adding more of the other ingredients to balance the flavor out (until it tastes right). Hi there! This recipe(as well as all of your other ones :) looks really yummy but i can’t seem to move past the maple syrup! That’s a lot and i can’t really afford to buy that much maple syrup :( Would i be able to use sugar instead? Hope to hear from you! Thank you again! Hi Renae. 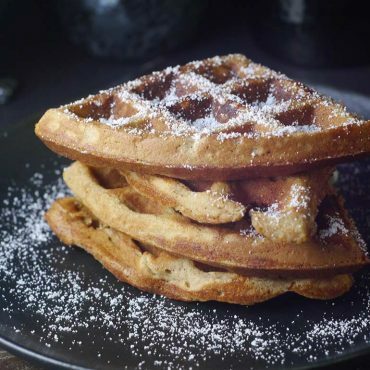 This recipe was designed for liquid sugar, but it doesn’t have to be maple syrup. You can use agave, brown rice syrup, coconut nectar, cane syrup (if you’re ok with sugar), etc. — whatever is available to you locally. Usually if I can’t find maple syrup I go for agave since they are comparable in sweetness levels. Otherwise if you add in a dry sweetener (regular sugar) the consistency / recipe balance would be very different (since you’re adding a lot of “dry” matter and taking away a lot of thick liquid. I would love to make this beautiful cake for my son’s 1st birthday as well! We are not gluten-free, but I like to limt my family’s intake. However, we are abroad right now, and many of the ingredients this recipes calls for are either unavailable or just too pricey. So I’m going to attempt the cake using whole wheat or spelt flour. But I was wondering if I could sub the coconut butter in the frosting blend with raw cashews and coconut oil? Do you think this would work? Hi Zakiya. I think raw cashews and coconut oil could work. Just something to take into account when decorating: in my experience with a cashew / coconut frosting — it comes out a little runnier / not as fluffy. It’s still good though, but won’t look the same as the frosting pictured here. Ok. Thank you so much for your response! Thank you so much for responding so quickly, Audrey! My son will be so pleased. Hi Kel. It should hold up fine if you want to deliver it. I would chill the bag though on the way. The frosting is quite sturdy (not melty), but I think the cake would still fare best if kept chilled. I usually place my cakes for transport in a cake carrier / container and pack it into a sealable lined cooler bag (or just any bag if cake is too tall / big for my cooler bags), with an ice pack underneath and an ice pack on top. That does the trick. Dear Audrey, I am going to attempt your lovely cake for my brother. Should I bake this the day of his birthday, the day before or even 2 days before? If I can bake it early, I am assuming I would just refrigerate and bring to room temp for serving? Thanks for your help! Your creations are beautiful! Hi Linda. Thank you! Yes, I’d refrigerate the cake as you suggested. It’s best made a day before. It was great on day 3 as well, but I think it’s best fresher. Is there anything to use in place of the guar gum for the dry cake? Or can it be left out and still achieve a similar consistency as it would made to recipe? Hi Lee. I’m not sure you could leave it out entirely. 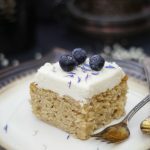 I’ve tried it without once with a modified version of this cake and it didn’t come out as planned — I’m not sure if it was due to leaving out the guar gum or because of another change I made though. You could replace it with an equal amount of xantham gum. Or you could try substituting with psyllium husk — you’ll need to experiment with the quantity though. I’d start with 1 tbsp and see how that turns out. If you try that or something else, I’d love to hear how it works out. 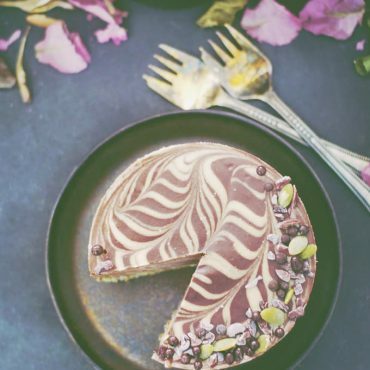 Im SWOONING over this birthday cake perfection! Literally all I need on my b-day! Hi there! I made this on Friday and it tastes amazing with the almond extract. Absolutely amazing. The only issue was it was pretty grainy. . which I think is the brown rice flour. Is there a way to eliminate the graininess? Also, I had no coconut butter so I used some coconut oil and shredded coconut.. . .unfortunately, that didn’t set up like I would have liked. But it tasted amazing as well. The whole dense cake experience was so fantastic and special for my boyfriends birthday. Thank you so very much. If you could lead me to a less grainy flour, I would appreciate it! Thanks so much for the lovely feedback! So happy you both liked it. As for the grittiness… Did you change anything in the cake recipe part? If not, then I’d have to say it usually does come down to gritty rice flour… You can buy a superfine rice flour (King Arthur makes a great one) or find a local brand of a more finely ground one instead (that’s what I do). The sweet sticky rice flour helps as well — did you use that? Hey again, Lisa. So… I have a follow up. I remade the cake last night with almond butter and in smaller pans and ended up with a rather grainy cake. When I read your comment initially because my cake with the cashew butter was no-where near grainy. In fact it was soft, springy, very moist. So I thought maybe the flour you used was coarse? But having experienced the almond butter dry and grainy cake I’m now wondering if yours turned out something like that for other reasons…? Can you let me know, if you get a chance, whether you used cashew butter? And if so, was it creamy or dry? How long did you bake it for? What pan size you used? It would be super helpful. Such birthday cake. Much delicious! I can’t wait to try this. Thank you for the recipe! Yummie, looks fantastic, spongy and delicate too due to the beautiful decoration of yours – love it!!! Already thinking of all the variations possible :-D. I love your work, you have amazing ideas and everything looks so beautiful. Oh Audrey this is just beautiful. I was just about to make the cake but I have no guar gum and keep forgetting to buy it! :0 I was going to use a different frosting because I typically try to avoid soy, but this is just gorgeous that I am going to have to try silken for the first time!! Aw, shucks about the guar. 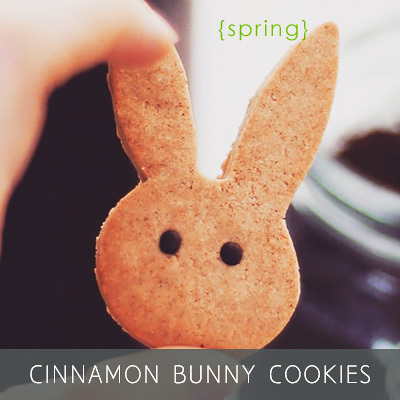 Hope you get to try it out though :) — with whatever frosting. It’s good with chocolate :) or just a regular coconut whip. Yay, Tina!! I’m so happy you’re still going strong with the baking :) Can’t wait to see the pic. I love this cake in the smaller batches as well. 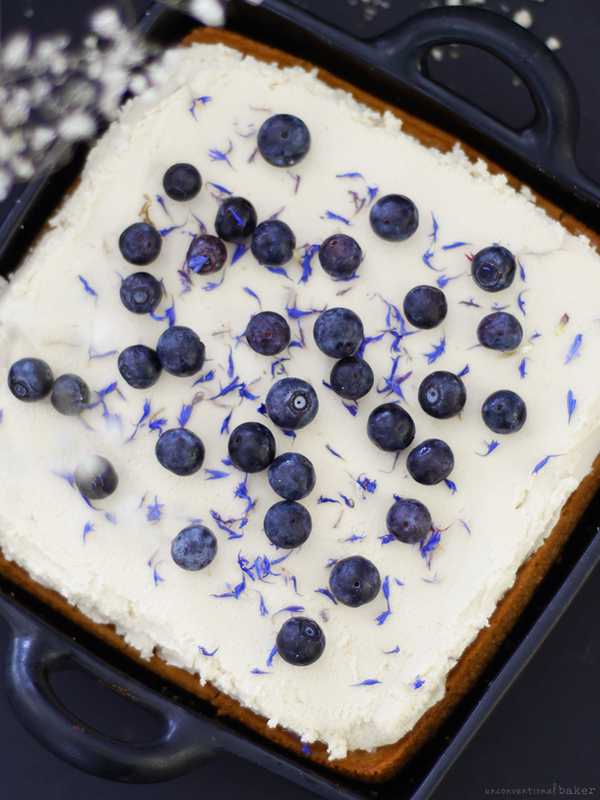 Blueberry lemon sounds great — I should give that a try; it’s been a while since I made a blueberry lemon baked treat. 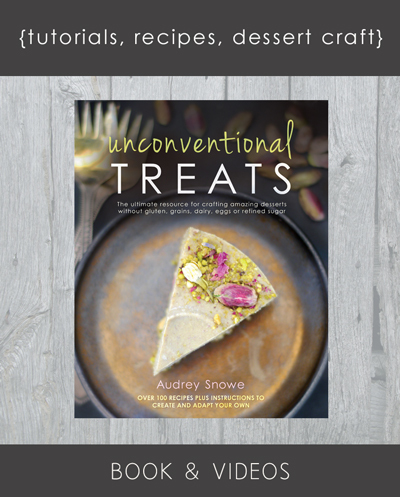 Hi Audrey, I was wondering if this would work with wheat flour instead of the flour combo since I’m not gluten-free? It looks delicious! Nix the tofu and make this for my 20th birthday in June…okay? Good ;) Hahahaha! YUM!!! And so gorgeous! Wuau!, it looks so delicious! OMG!